Scene of the Blog Featuring Marieke of "Lady Fern"! Those of you who are regulars here know that I love the Highlands of Scotland, so when I discovered a book blogger who lives there, you know that I had to email her to ask if she'd like to be a guest here on Kittling: Books. Thankfully, she agreed! which has all sorts of connotations for me, but it's rather long, so I tend to shorten it to Lady Fern. On her blog she says, "I'm loving the freedom to read whatever I want. And to say anything I like about it." She doesn't always have happy thoughts to share, but if she says something negative, she backs it up with citations from the book in question. I love reading her reviews, the ongoing book discussions, the tidbits she gleans from various sources, getting to meet a fellow book blogger for the first time-- her blog is a fun place for me to spend some time. If you've never had the pleasure of meeting Marieke, I hope you take this opportunity to head on over to her blog Lady Fern to say hello. Before Marieke shows us where the blogging magic happens, don't forget that you can click on each photo to view it full size. Now... let's meet Marieke! About me: I'm an American living in Scotland for about 3 years now. I'm originally from northern California and also lived in Washington and Oregon (but nothing really prepared me for Scottish rain). 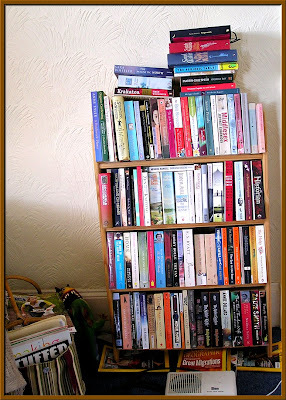 I mostly write about the books I read (literary fiction, Booker and Orange prize winners, random books) and sometimes write about being an ex-pat or an observer of British culture. A sunny afternoon in the living room -- it's not always this bright! 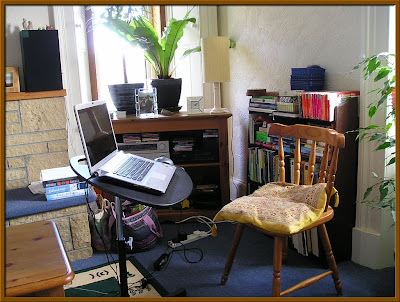 I nearly always blog from the living room where it's warm and cosy and where my books are. 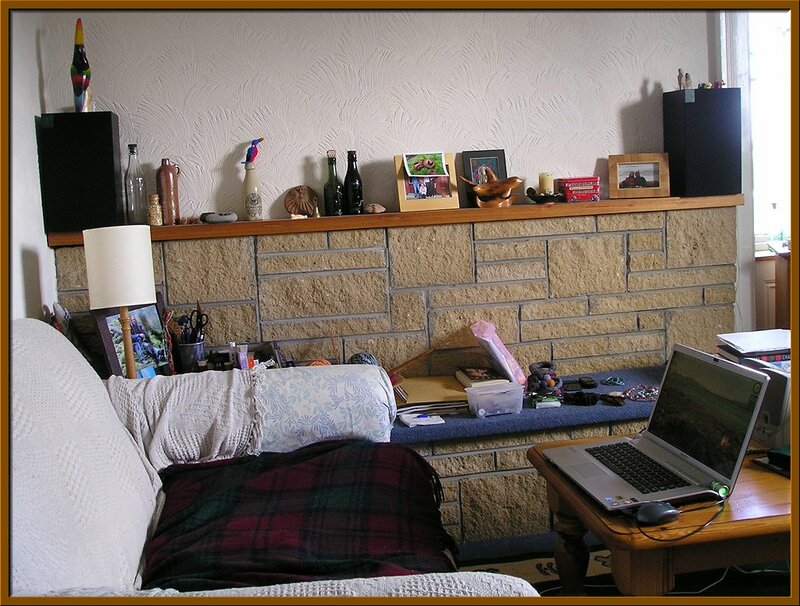 Plus, you can see a bag of knitting in the corner, handy while listening to audio books. Most often, I am found blogging on the couch. There is always a good amount of clutter around -- see jewellery pieces I'm working on, and the bowl of knitting just peeking out from behind the arm of the couch. That's Fingersmith hiding in the pile of stuff on the bench. It's an awkward bookshelf. See how it leans, and how it's propped up by National Geographics. Good thing there is a frog and dinosaur team waiting below to catch any books as they fall. These books are mostly unread, but some are old favorites, and they aren't really in any particular order. Most of these came from Oxfam or were donated by friends. You can probably tell a lot about me from this collection! 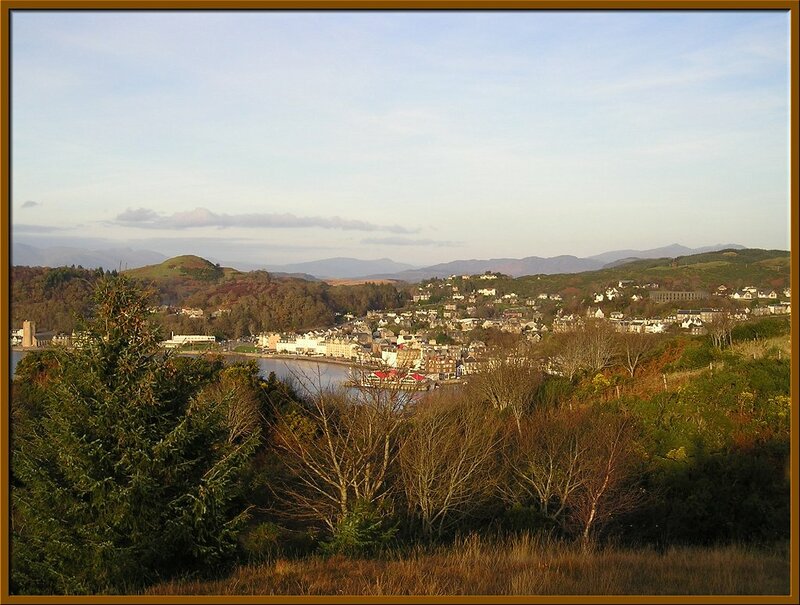 This is the town of Oban in its winter colors. 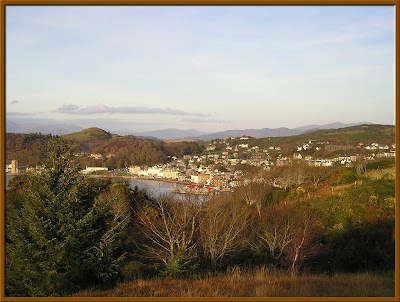 I'm standing on a hill overlooking the little bay of Oban, where you can see, from left, the sand-colored cathedral, the row of grand hotels along the esplanade, the red roofs of the North Pier restaurants, and up on the hill above the houses, McCaig's Folly. Don't let this picture fool you into thinking that the sun always shines in Scotland! I, for one, would not be tricked by your photos into believing that Scotland is a sunny country. Not only have I been there, but while in the Royal Navy, my British husband was stationed in an area of Scotland that received rain over THREE HUNDRED days per year. I love visiting Scotland, but I need my 300+ days of sunshine that I get here in the Sonoran Desert! 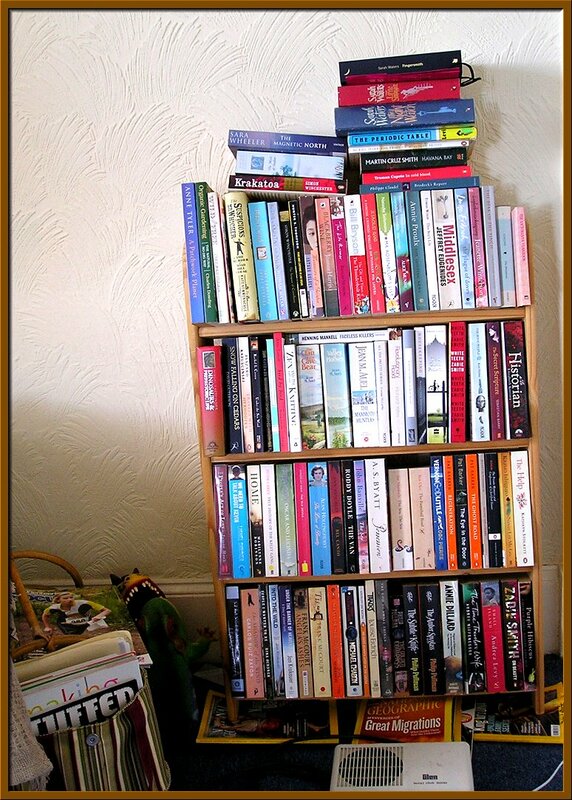 Marieke's home does look cozy, and I think I once had the cousin to her wonky bookshelf (only I had old issues of a horse racing magazine propping mine up). It was grand seeing the view of Oban, too. It's been too long since I've visited the Highlands. Now that my health is so much better, I'll have to change that. 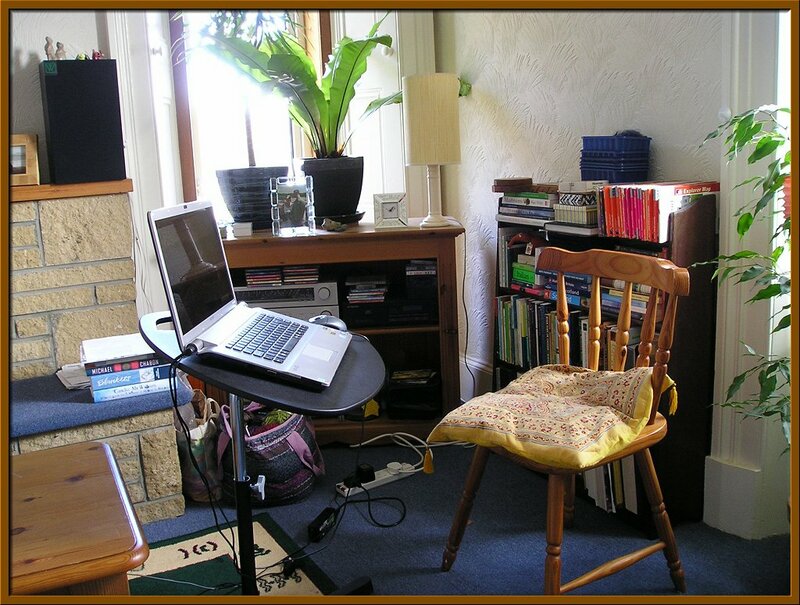 Thanks so much for letting us take a peek at your blogging spaces, Marieke. It was a pleasure! 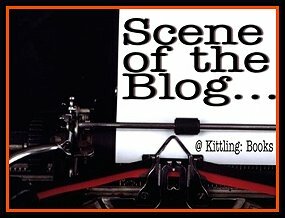 Who'll be my next guest on Scene of the Blog? Stop by next Wednesday to see! When Dave and I went to the Highlands several years ago, I had packed for cool, rainy weather so of course it was sunny and warm the entire time we were there. I loved the views and the sheep everywhere you looked. Scotland is such a beautiful country I find it hard to understand why my ancestors left. Her space does look cozy. I don't think I could take all the rain, though. I'm going to check out her blog. What an honor! Thank you so much for the feature. We're having torrential rain here at the moment, and the roads are flooding, so these sunny photos I took look especially nice! One day, my husband and I will visit Scotland. He is an avid golfer and it's his dream to golf in Scotland. Me, I've read so many books set there that I feel I must see it with my own eyes. Lovely to see Marieke's space and I loved the picture of Oban. Barbara, The sheep really are everywhere! The lambing season has just started and it is magical to see those little fluffy dancers. Kay, I hope you and your husband do make it to Scotland. It's so rich with history and amazing landscapes, I don't think anyone could ever see it all.